Cha Ok locks the text message evidence that Dal Po gave her away. In Ha is back at MSC but she declares she is not back to be quiet. Reminds Gong Joo what he said before about reporter’s responsibility. She believes in him and what he said before. Gyo Dong asks Dal Po if he believes Cha Ok will change. Wonders if Dal Po is making a mistake about Cha Ok.
Dal Po has other evidence though. An informant who wants to remain anonymous. Cha Ok reports to Ro Sa that the messages have been taken care of. Ro Sa wants to meet In Ha, Cha Ok says she will take care of In Ha. Ro Sa points out it is the first time Cha Ok said no to her request. Cha Ok tells Gong Joo she will not participate in the item meetings anymore. In Ha brings up Ahn Chan Soo story again at the item meeting. In Ha wants MSC to do report it, as a repentant voice. Il Joo puts it to a vote. Only In Ha and Gong Joo raise hands. No one else. But Gong Joo backs out, seeing that no one else has raised their hands. Gong Joo decides to report to Cha Ok and let her deny it the news item. Except Cha Ok says yes. Tell Gong Joo to investigate with Yeon Doo Young knowing. Cha Ok will report it. Gong Joo is shocked. Gong Joo tells Il Joo about this too. Gong Joo calls wife to tell him he will be fired soon. 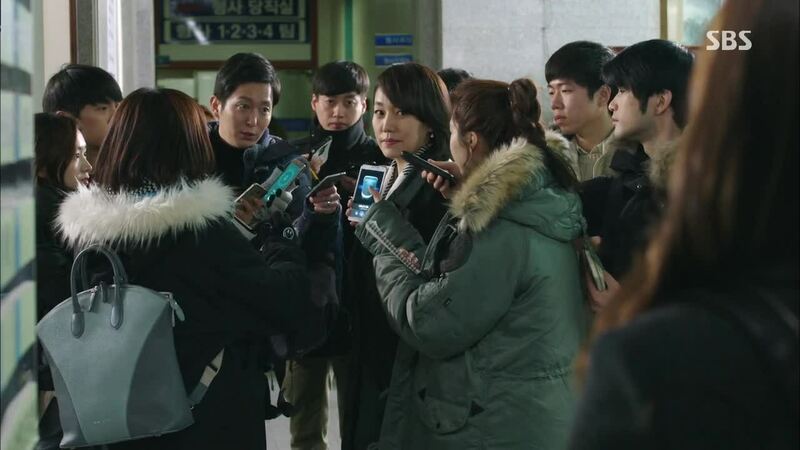 Ro Sa gets a call from Yeon Doo Young. 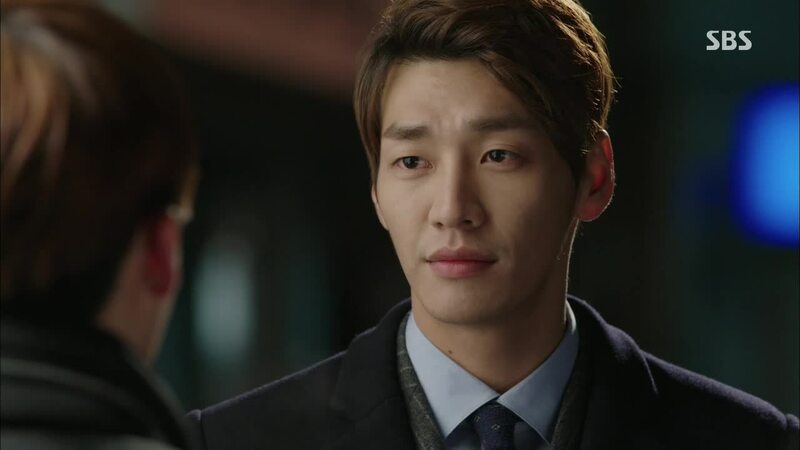 Il Joo has reported to him that Cha Ok will let Gong Joo investigate. Ro Sa says she suspected as much, thinking back at Cha Ok’s refusal to let Ro Sa see In Ha. Ro Sa finds both Cha Ok and Dal Po annoying. Dal Po is walking In Ha home. In Ha tells Dal Po about Gong Joo possibly siding with her. Dal Po asks how Grandpa is, he is okay. Dal Po safely gets In Ha out of the way of a motorcycle, racing towards them. He gets a bad feeling. Dal Po finds Beom Jo outside his door. He came to see how Dal Po was doing regarding the promise. Flashback. Boom Jo tells Dal Po he is giving up being a reporter to get answers from his mom. He will hear answers and come see him. Beom Jo makes fun of Dal Po’s small “one room” apartment. Dal Po secretly shakes Beom Jo’s can beer hard so it will explode when he opens it. Boom Jo confesses to Dal Po how his mom was such a good person to him and what he is doing now to her hurts him. We see Beom Jo recording everything with his mom. He says to Dal Po he might not be able to come through in the end. Dal Po replies that is why he is not going to push Beom Jo. Dal Po says In Ha thinks badly of Beom Jo, thinking he is mama boy again. Strange guy in front of Dal Po’s house. Also comes to YGN to deliver something. Specifically to Ki Ha Myung. Delivery guy starts shooting with pelts(?) of some sort. Demands Ha Myung comes out. Ha Myung attempts to take him down. After some struggle, delivery guy gets away. Looks like he has something in his jacket pocket. In Ha is reviewing MSC interviews with Congressman Kim Kyung Woo (the politician involved with the factory fires). MSC has done a lot of coverage on him. Cha Ok volunteers to help her. Delivery guy is now in MSC looking for Cha Ok and In Ha. Dal Po makes connection between guy last night and today’s guy. Runs to MSC. Gyo Dong thinks Yoo Rae is bleeding because of the blood present, but blood is Dal Po’s. Guy finds Cha Ok and In Ha. About to hurt them but Dal Po comes. Struggle ensues and Ha Myung takes him down. At hospital, Dal Po is getting surgery for his shoulder. In Ha and Cha Ok wait outside. Gong Joo and Gyo Dong come. Ask who would have an issue with Cha Ok, In Ha, and Dal Po. Cha Ok suspects Ro Sa. YGN has come to MSC to investigate, MSC is about to go to YGN to investigate. Guy is being questioned at police station. Reporters are listening in. Yoo Rae texts detective to speak louder so they can hear. Detective obliges. Turns out guy is son of the bus company president, the man who falsely claimed his employee died of natural causes, not suicide. Yoo Rae reports. Beom Jo watches. Beom Jo listens to recordings again. He is in turmoil. Dal Pyung and In Ha wait for Dal Po, who comes out with a sling on his arm. Dal Pyung tells him to come to their house to rest for a while. In Ha tells Dal Po about the guy being the bus company president’s son. Asks how Dal Po knew the guy was going after her too. He tells her about the motorcycle. YGN. The higher ups discuss. Gyo Dong wonders if it is really about the bus. The guy could have sued but he didn’t. It could be a warning, to keep their mouth shut. Lee Young Tak asks what Ha Myung is investigating now to be receiving these warnings and Gyo Dong tells him it is about Park Ro Sa. 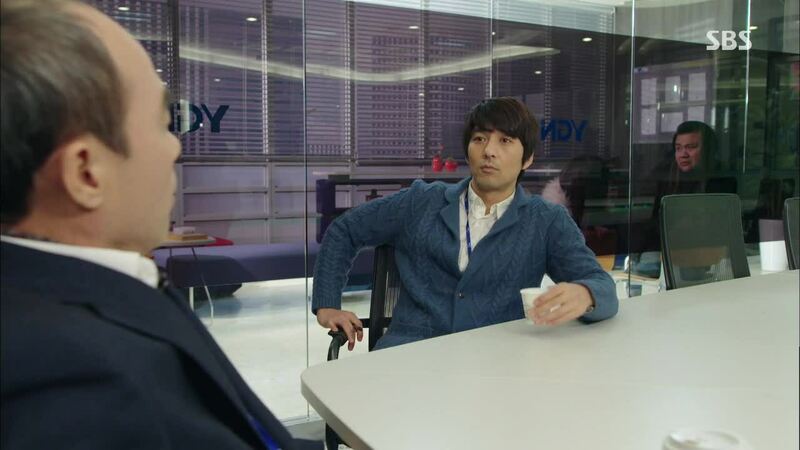 The guy reporter and Yoo Rae are trying to eavesdrop on this meeting but they can’t hear. The other reporter tells Yoo Rae that Gyo Dong might really be into Yoo Rae. But now Yoo Rae doesn’t believe. Asks for facts, won’t believe in speculation anymore. 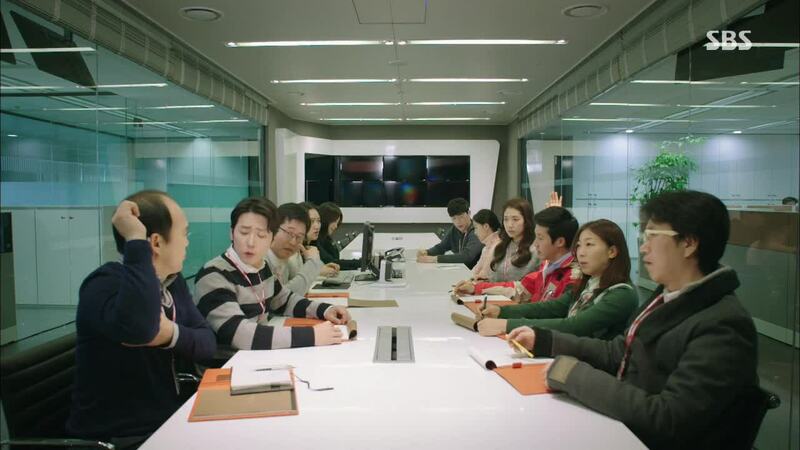 The YGN higher ups inside the meeting room can see the two trying to eavesdrop. Gyo Dong compliments Yoo Rae for her “reporter mentality” and Lee Young Tak finds Gyo Dong’s behavior suspicious. Cha Ok tells Ro Sa about the incident, Cha Ok basically comes out to accuse Ro Sa of hiring the guy. Ro Sa basically admits it too, using a hypothetical, saying- If I did, it means there is something wrong so before our relationship totally breaks, let’s be careful. Later with Beom Jo, Ro Sa says Beom Jo looks like he has a lot of questions. Beom Jo asks about the “reporter terror” incident, and Ro Sa admits she got the guy to do it. Beom Jo is recording. Ro Sa says she wanted to warn the three reporters and also wanted Beom Jo to know. She grabs his phone and takes it away from him. She says she knows her son well, she knows when he is lying and how disappointed he is in her. She is sad that she disappointed him too, worried her kind and upright son is hurt. “Let’s go back to the way it was before,” she wants him to only see good, she will do all the bad stuff. In Ha and Dal Po come home. They eat dinner. Both Grandpa and In Ha offer him kimchi, Dal Pyung is just a minute too late to offer some too. In Ha shaves Dal Po for him, which brings their faces extremely close together. Dad catches them, but he gives up on interrupting them. Dal Pyung goes to Grandpa’s room. Dal Pyung says he dreamed a strange dream last night where Dal Po asked to date In Ha. Grandpa says that is nonsense, since Dal Po is his son and In Ha is Dal Pyung’s son. Dal Pyung says I agree, it doesn’t make sense. Cha Ok tells Gong Joo to prepare the report by tomorrow. She will makes sure to report it on air tomorrow. Tells Gong Joo Park Ro Sa is threatening them. But Cha Ok says “You can try to cover the mouth of one or two people, but not thousands of people.” And that by reporting the story on the news tomorrow, Cha Ok will be telling thousands of people about Ro Sa. 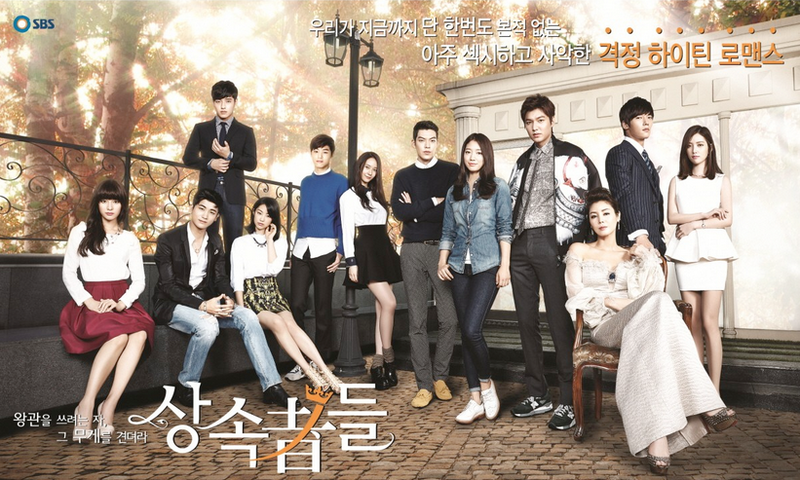 Except Cha Ok and Gong Joo have been transferred to different departments. Cha Ok knows Park Ro Sa is trying to take their microphones to the world away from them. Gong Joo tells In Ha about everything Cha Ok told him about Park Ro Sa and that Cha Ok had told him to do the investigation. In Ha apologizes to him and Gong Joo thanks her for making him feel like a reporter again. Cha Ok calls In Ha to meet. Cha Ok thinks about what Dal Po said to her, about trusting that Cha Ok once considered herself a true reporter. In Ha delivers to Dal Po, telling him about Cha Ok’s favor. In Ha tells him that Cha Ok also told them that the 14-year-old incident won’t be much help. They need a current case- Chan Soo needs to sue Cha Ok for defamation. If he does, Cha Ok will be called in to be questioned. Then Cha Ok will reveal everything- about Ro Sa, MSC, everything. Then it is up to the In Ha and Dal Po to correctly report everything, not be swayed, and to keep at it doggedly. She warns them that Park Ro Sa will do anything to move the media. Dal Po asks Chan Soo for the favor. Chan Soo does it. 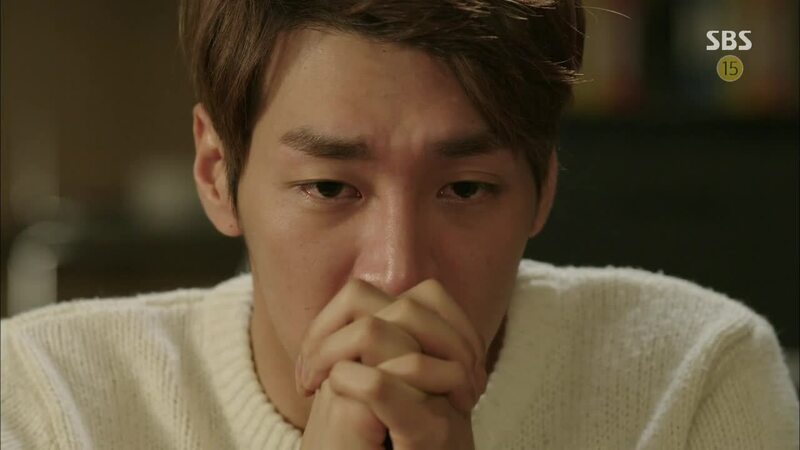 In Ha asks Dal Po if he was as in as much pain like she is now when he was watching his brother. How did he bear it? Dal Po confirms that he was in pain and he can’t say that the pain is gone, even now. In Ha apologizes to Dal Po. She knows her mom is making the right decision but she is worried about her mom. Dal Po says he understands and hugs her. Dal Po tells Jae Myung everything. But Jae Myung notices that Dal Po looks sad. Dal Po apologizes, saying he isn’t entirely happy because watching In Ha is like watching himself reporting on his brother. Jae Myung confesses that he was going to end Cha Ok and himself on that day of the interview, but he thought about Dal Po and wanted to see how Dal Po would become a good reporter. So Dal Po saved him. Ro Sa’s secretary reports to Ro Sa about Cha Ok receiving summon. Secretary is worried about the reporters reporting on this story. Ro Sa is not too worried, saying she wonders if the reporters will even be heard. She summons MSC’s Yeon Doo Young. Cha Ok is at the police station. Other reporters question her and she answers them, also instructing them to ask better questions when they ask her stupid ones. In Ha watches and smiles. Cha Ok runs into Ha Myung in the hallway. He says he will come to interview her after she finishes with the police. Cha Ok remembers when she first met Dal Po as a taxi driver and she had called him a puppy who barks at a tiger without knowing anything. YGN and Dal Po report on Cha Ok.
Cha Ok admits to reporters she was wrong and that she also followed orders from Ro Sa and MSC higher-ups. Admitted it started from 14 years ago. Il Joo can’t believe that Cha Ok would do that. But both Gong Joo and Lee Joo Ho are proud of Cha Ok and embarrassed about MSC. At YGN, Gyo Dong pats Dal Po on the shoulder, proud. Cha Ok and In Ha watch Dal Po’s report together. In Ha asks if mom is okay, Cha Ok says she is not, tells In Ha to relay to Dal Po to put the most important part in the front, like Park Ro Sa’s interview. Cha Ok tells In Ha to keep an out of for what Ro Sa will do next. Gong Joo joins them to say that Ro Sa will call legal team and first try to avoid going in to be questioned. Speak of the devil, that is what Ro Sa is doing. But Cha Ok has told In Ha and In Ha tells Dal Po that Ro Sa will say she is overseas but will really be in the country, at Chongjongri. YGN news reports on this. So Ro Sa gets another summons. She is mad that a one-minute news report is causing this problem for. Ro Sa gets another call from a politician, nagging her. Ro Sa is mad at the lawyer. Lawyer assures her that the police commissioner is one their side. Lawyer tells Ro Sa the plan to go in early, away from reporters’ eyes, to be questioned. But Cha Ok and Gong Joo prepare In Ha about this and all the reporters, including Dal Po, are there to film Ro Sa coming into the police station to be questioned early Sunday morning. Dal Po says her politicians will be angry to see this and Ro Sa loses her cool and yells at him to shut up. In Ha prepares Dal Po that Ro Sa’s side will try to use a scandal about a celebrity to cover her story up. 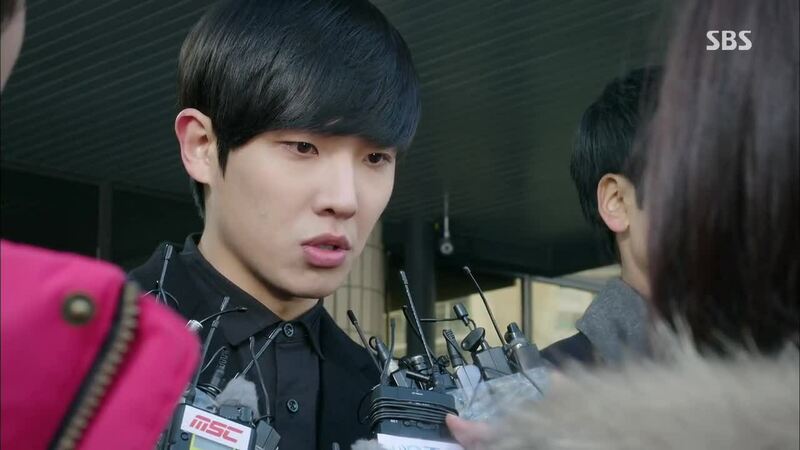 Lawyer says they can use their Beom Jo mall model- it’s a cameo by Lee Joon, as the celebrity FAMA. Yoo Rae sees this news and she is upset that it is about one of her biases. Reporters question FAMA before he goes in for questioning at the police station. Yoo Rae says she knows her “oppa” won’t do that, she will protect him, and she will reveal the truth. Next news that FAMA is not guilty of abusing propofol. Ro Sa’s lawyer says this story is supposed to last longer but YGN was too fast in reporting FAMA’s innocence. Ro Sa gets another call from a politician. Lawyer suggests that Ro Sa apologize to Chan Soo since if he takes back his suit, nothing will happen to her. Cha Ok warns In Ha about this and asks if Chan Soo is the type to be swayed by Ro Sa, since he has three kids to support. To In Ha and Dal Po, Chan Soo says he won’t. Says to Dal Po that he started this fight for Dal Po so he will only stop if Dal Po tells him to stop. Chan Soo tells them they can pay back by coming to their housewarming party with gifts, a party, In Ha points out, is for a house they moved in three years ago. Dal Po and In Ha come home. 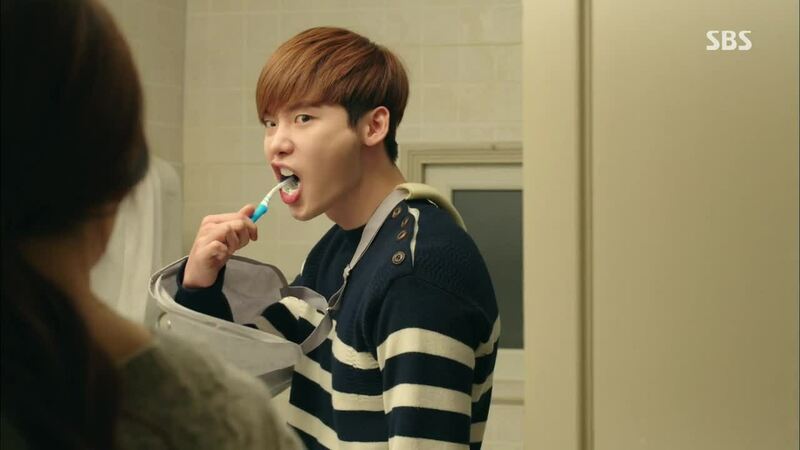 In Ha puts toothpaste on the brush for Dal Po thinking his arm is still injured but she catches him later easily brushing his teeth with his “injured” arm. She asks him why he lied, is it because he doesn’t want to go back to his other house and wants to be with Grandpa, Dal Pyung, and her. She asks him to come back to this one, is he still concerned over his brother? Dal Po says no so In Ha tells him to return to this house, she doesn’t want him living alone like that. Ro Sa’s people bring Chan Soo gifts and money, Chan Soo is slightly swayed by the thick envelope, but thankfully YGN people come and Chan Soo gives back the money. Ro Sa’s people report to Ro Sa and she is about to blow her top. Lawyer suggests that Ro Sa just go in for questioning but she doesn’t want to, knowing it will lead to her downfall. So Ro Sa suggests that they do things her way now, and Beom Jo is listening outside her door, crying, whispering for his mother to stop. At MSC, there is a notice that Cha Ok has been summoned to stand in front of a personnel committee, basically meaning she is likely to be fired. In Ha finds her mom sleeping at the office, which In Ha finds fascinating since she has never seen this before. She stand in front of Cha Ok, blocking the sun from her face. Cha Ok wakes up, explains she is tired, all her lack of sleep from the past 15 years is catching up on her. Cha Ok says she knows about the notice. Before In Ha leaves, she grabs In Ha’s hand and asks her to stay and continue blocking the shadow. Dal Po finds In Ha in the police station, standing along listlessly in the hallway. He asks if she is okay and she brightly says yes, but she hiccups and so she admits she is not okay. He hugs her and In Ha says she should have hugged him like this too even when he told her to not do anything for him. Dal Po gets reminder from Chan Soo about his housewarming party and to also bring Yoo Rae. Yoo Rae won’t go with Dal Po so she asks the other guy, who says he is busy. 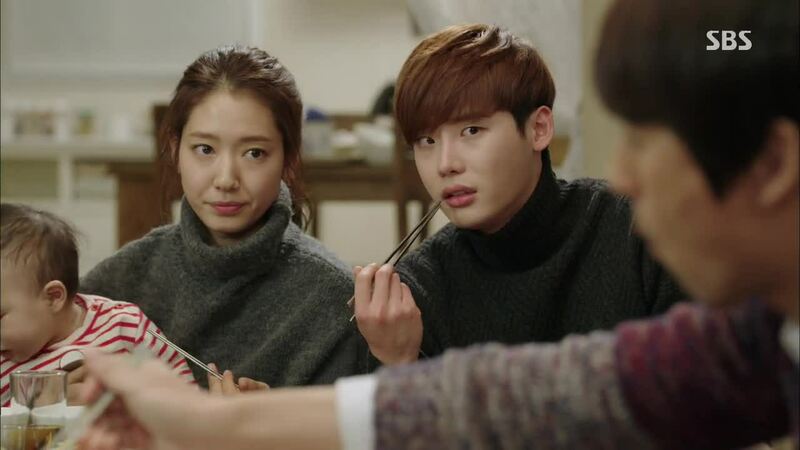 So she asks Gyo Dong thinking he will say no but he says yes and everyone at the house warming party is curious why he came. They talk about how the money Ro Sa offered Chan Soo could have paid back house debt and send kid to school. Beom Jo is outside Chan Soo’s house. Chan Soo turns on video recording of the quiz show he and Dal Po were on years ago. Yoo Rae is shocked to see Dal Po as the country bumpkin he used to be. Beom Jo hears their laughter from outside and can’t come ring door bell. But Dal Po sees him and comes outside. Beom Jo tells Dal Po that his mom won’t be back down but he doesn’t have the courage to report on his mom. Dal Po tells him not to be sorry, he knows how hard it is to be an informant on your own family, and he has given up on revenge and anger a long time ago. He is just going to focus on being a good reporter. He likes Beom Jo and he likes In Ha more. He found every moment spent on revenge and anger to be wasteful when he can spend his time loving In Ha. Dal Po tells Jae Myung the same thing, apologizing. 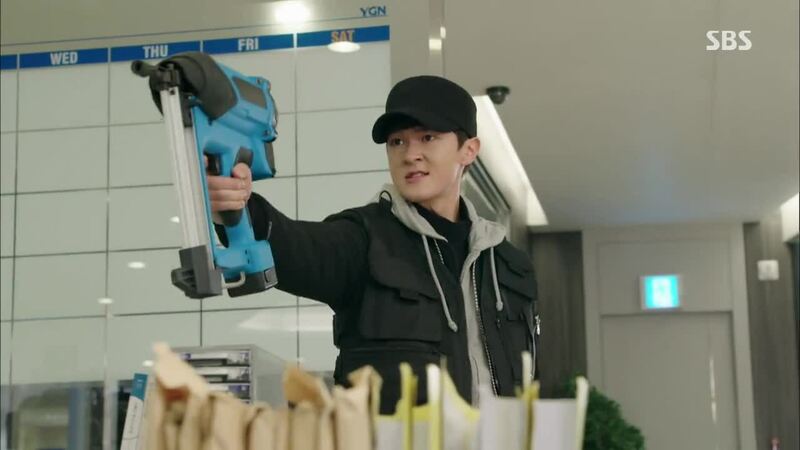 He saw that if he held onto revenge and anger, he would be a reporter like Cha Ok. But Jae Myung tells him not to be sorry to him, Dal Po has the right to, and Jae Myung, as someone who committed murder, has no right to be angry or to offer forgiveness. As long as Dal Po remains the good reporter, he has the right to be able to let go of anger and revenge. Beom Jo finds his mom practicing her speech. He hugs her, saying he didn’t know how hard she had lived her life until now. That he lived his life reaping the fruits of her hard work. Ro Sa says he doesn’t need to know, all he has to do is enjoy. Beom Jo apologizes again. Yoo Rae is showing the guy reporter the photos she took at Chan Soo’s housewarming party. He points out Gyo Dong staring at Yoo Rae in every single picture and Yoo Rae finally start to believe that Gyo Dong might like her. Beom Jo goes to see the delivery guy (Jo Dae Guk) in prison. Pretends to deliver the message that Park Ro Sa is pleased with him and will keep her promise to him. Dal Po tells In Ha about Beom Jo. Hyun Gyu calls Dal Po to instruct him on reporting on the opening ceremony for Ro Sa’s new mall complex. Il Joo calls In Ha for the same thing, but instructs her to cover it more as a press release, advertising format. In Ha is upset she is not doing real reporting. Beom Jo comes to the police station and remembers his times here with In Ha. He runs into her in the hallway. Beom Jo says he came to ask a favor and since he ran into her, he can ask her to do it. Beom Jo won’t be there at his mom’s opening ceremony but if In Ha ends up interviewing his mom, please relay his message to her. 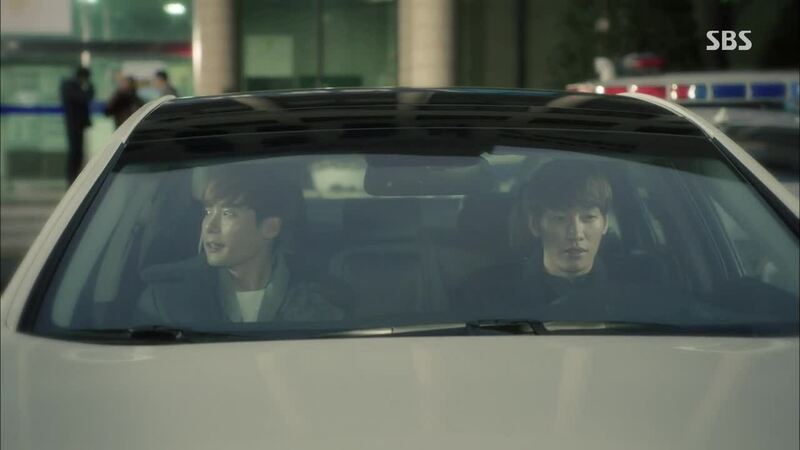 Beom Jo goes to the detective to confess that he is the one who hired Jo Dae Guk to terrorize Cha Ok, In Ha, and Beom Jo. He confesses that he promised life-time employment in return. Yoo Rae reports this to Hyun Gyu. 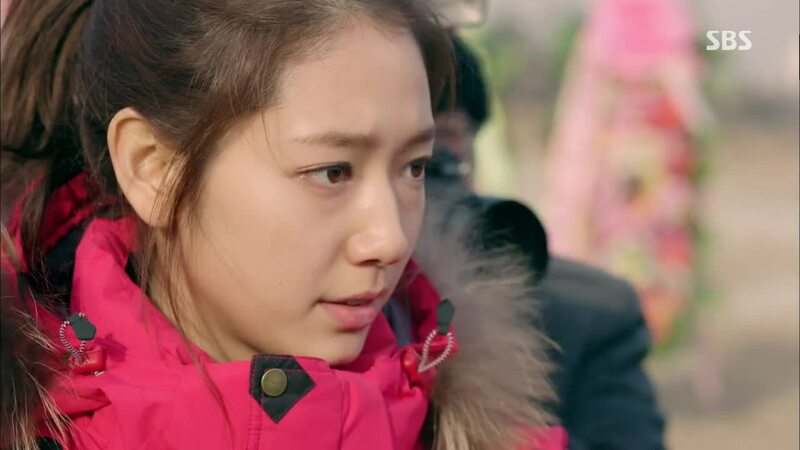 She says the police called Jo Dae Guk’s side to confirm and the police confirmed that Beom Jo came to see Jo Dae Guk. Politicians on their way to the ceremony get calls and they turn back, frightened on the impending media attention on Ro Sa. Ro Sa’s secretary gets a call about Beom Jo and tells Ro Sa who is completely shocked. Reporters there, including Dal Po and In Ha, watch and film. 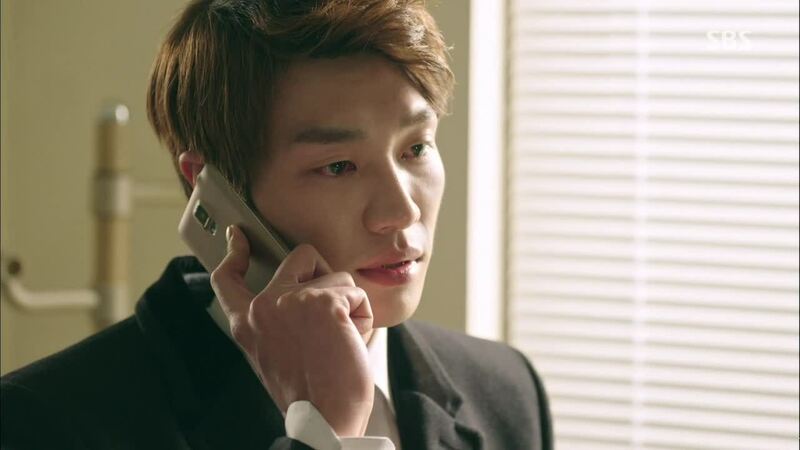 Dal Po gets a call about Beom Jo, everyone starts getting a call. 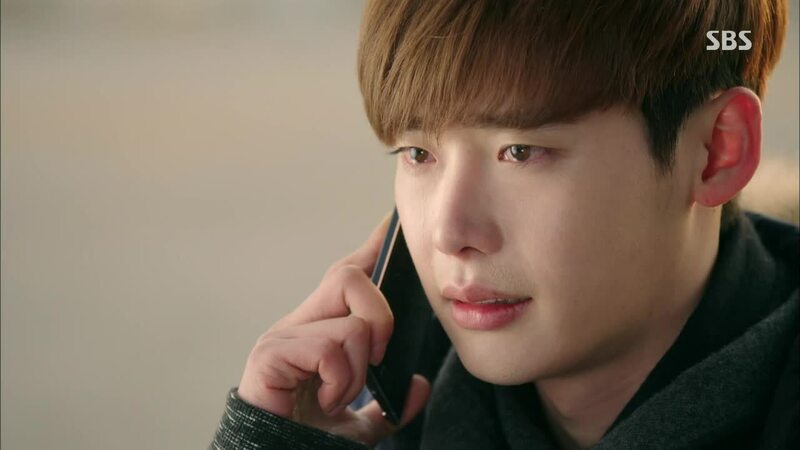 Dal Po tries calling Beom Jo but he is not picking up. Dal Po suspects that Beom Jo is doing in his mom’s stead. In Ha remembers back to Beom Jo’s favor. He asked her to tell his mom something. Ro Sa takes this in and asks In Ha where her son is. In Ha tells her. Ro Sa drives off to the police station. 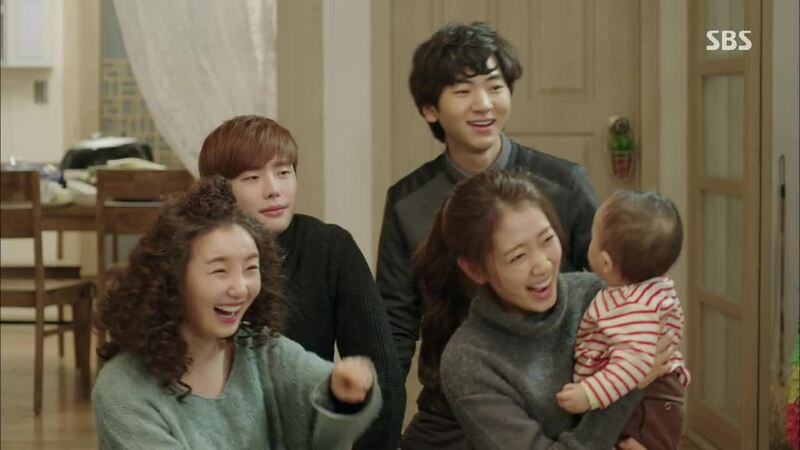 One of the reasons why I like Pinocchio is because of its positive and loving message. There is so much good in this fictional world with people who struggle everyday to make the right decision no matter how hard it is. They fight the good fight because it is the right thing to do morally and because of their love for family and friends. In these two episodes, we saw Beom Jo, Cha Ok, In Ha, and Dal Po makes those hard choices and feel both the love, joy, and pain that comes with making them. Beom Jo’s decision is a painful one. He can’t bring himself to rat on his own beloved mother, no matter the horrible things she is doing. To him, his mother has always been good, kind, and loving. While he never asked her to do those things to give him a good life, he feels responsible for what she is doing and wants to share the consequences with her. He also knows the only way he can stop her is to hurt himself, the most precious thing to her. With that, Ro Sa will begin to really see how her actions affected innocent people and feel the pain and the suffering they experienced through her media manipulation. Cha Ok finally makes the decision to be a person her daughter can be proud of. She saw how her daughter fiercely fought to do the right thing and to protect the person she loved. 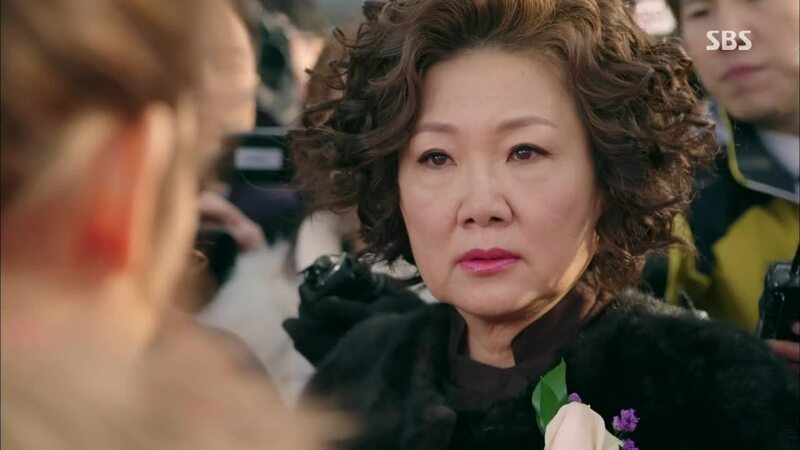 Cha Ok felt ashamed and embarrassed in front of her daughter and Dal Po and she finally breaks down, tired of pretending she didn’t care and tired of fighting for something that didn’t matter. What did she gain by accepting Ro Sa’s offer 14 years ago? Prestige, recording breaking titles, awards? What did she lose by accepting that offer? 14 years with her daughter, her daughter’s respect, her viewers’ trust, and her honor as a journalist. The decision to turn on Ro Sa isn’t easy because it means Cha Ok loses everything she struggled for for the past 14 years, but she gains a hand she can hold. The title of Episode 19 is “The Wind and the Sun.” That Aesop fable can be interpreted in different ways but for this drama, we can interpret it as teaching us that true strength does not lie in bluster. Ro Sa, like the wind in the fable, tries to use brute force, coercion, and manipulation to get what she wants, but In Ha and Dal Po remain steady and true to their craft. It is also through Chan Soo’s friendship, Cha Ok’s love for In Ha, and Beom Jo’s love for his mom that they are able to win. While I find Cha Ok’s change of heart just a tad sudden and rushed, especially since it was difficult fully comprehending all of Cha Ok’s motivation for doing what she did in the first place, the sense of peace in Cha Ok and In Ha relayed to the viewers felt real. 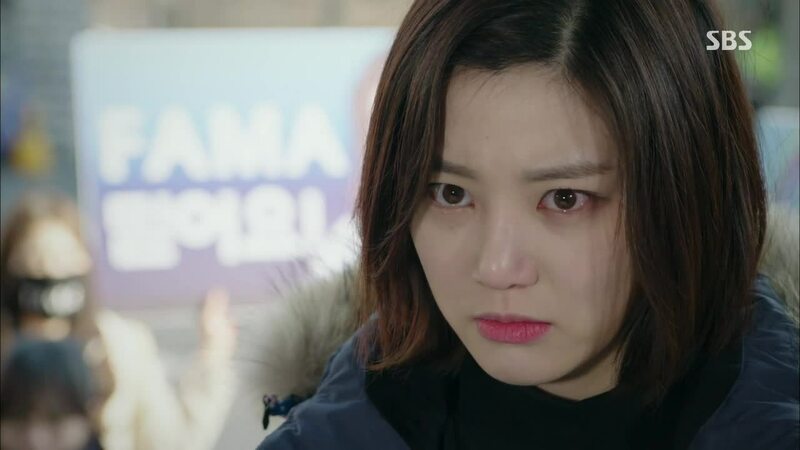 In Ha’s straightforwardness with all of her emotions and interactions with Cha Ok helped me to relate to Cha Ok more than I would have expected, especially since sometimes I wanted to claw her eyes out. In Ha was always sincere and honest with her mom and she was always a strong pillar of strength, determination, and honesty to everyone around her. It’s nice to see Cha Ok now resting in the shadow of that pillar. Joonni,u re super fast.I always enjoy ur recap.too bad Pinocchio is ending tommorrow.what drama will u be recapping next,Joonni? Big thanks joonie 🙂 I love your great recaps! You’re the best, Joonni! Thanks for your hard work! I really like how the writer has thematically linked each episode with a well-known tale. It’s really refreshing to have a live-shot K-drama so thoroughly planned out. Much thanks to your insightful commentary too! Looking forward to the denouement! Thank you joonni for the fast recap and your beautiful comment. It is always insightful and it helps me to understand better the characters and the message of the writer. One more tonight so have a good rest. Thanks a lot and get a lot of rest before the final showdown. Thank you so much, I’m waiting fot the last episode. 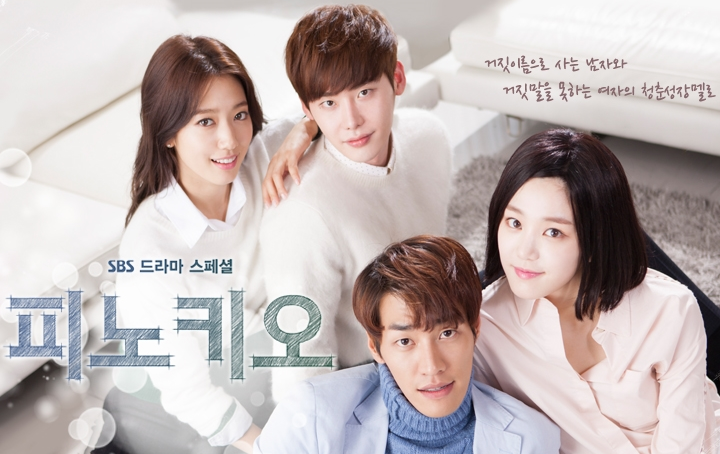 Thanks for sharing Recap: Pinocchio Episodes 18 and 19 | Scattered Joonni. will u?? Wish u r good n ready for this!! pretty plz!! !